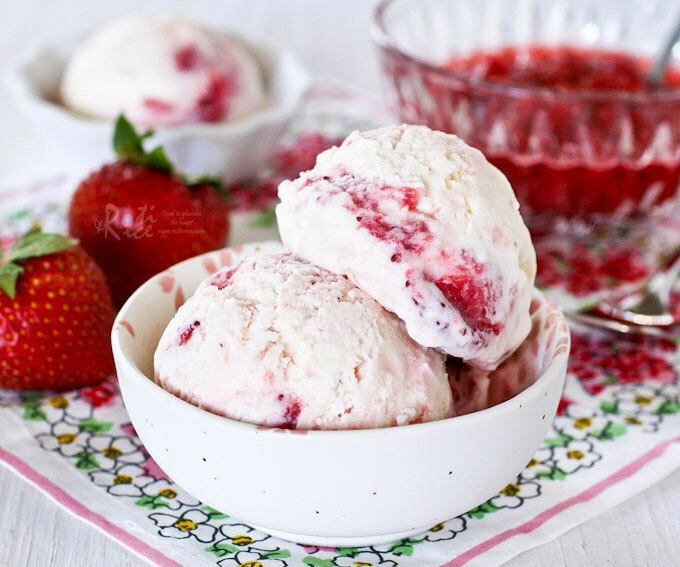 Strawberry Swirl Cream Cheese Ice Cream – a delightfully creamy homemade vanilla cream cheese ice cream swirl with a simple homemade strawberry sauce. Combine strawberries, sugar, and lemon juice in a medium sized saucepan over medium heat. Do not cover but mashed strawberries with spatula and stir until sugar dissolves and mixture thickens, about 12 minutes. In a small bowl, mix cornstarch with 2 tablespoons of milk. In another bowl, beat cream cheese until smooth. In a medium sized saucepan, combine remaining milk with cream and sugar over medium heat. Bring mixture to a gentle boil, stirring to dissolve sugar, about 2 to 3 minutes. Stir in corn starch mixture until slightly thickened, about 1 minute. Turn off heat. Ladle ½ cup (120ml) hot milk mixture into bowl with cream cheese to melt it slightly. Pour cream cheese mixture back into saucepan and whisk till smooth and combined. Add vanilla essence and salt and stir to combine. Allow mixture to cool. Cover and refrigerate for at least 2 hours. Place frozen bowl on base of ice cream maker and turn it on. Pour chilled mixture into frozen bowl and churn until desired consistency, about 15 to 20 minutes. Transfer ice cream to a container with a lid. Reserve ½ cup of strawberry mixture (to drizzle over ice cream when eating) and place spoonfuls of the rest all over ice cream. Gently swirl with a butter knife. Cover and freeze for a couple of hours. When ice cream is completely frozen, allow it to soften slightly on the counter before serving.